Packed in 2 parts: 2 mirrors in a folder & a box of stand. 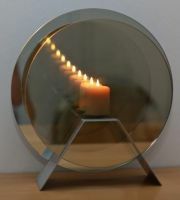 The Infinity Candle is a simple design using two circular mirrors and a single candle flame to produce an optical illusion of infinite regress effect. This size is designed to take church candles : The metal stand has a dish with spike to hold the candle in place with built in brackets for optional wall mounting. 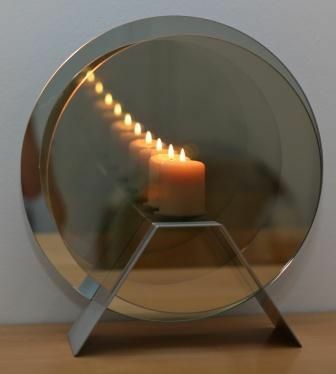 On all versions, the optical illusionary effect of the Infinity candle can be adjusted by tilting the back mirror to the left or to the right, forwards or backwards.